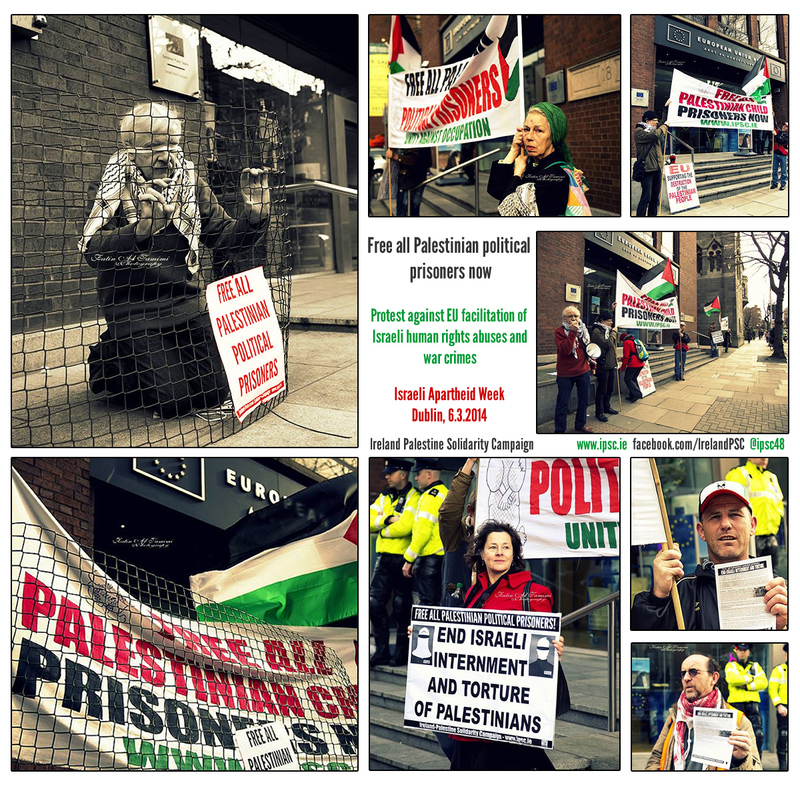 Between 1st and 8th March, Ireland took part in the 10th annual Israeli Apartheid Week with a series of events including meetings and protests organised by the Ireland-Palestine Solidarity Campaign (IPSC). 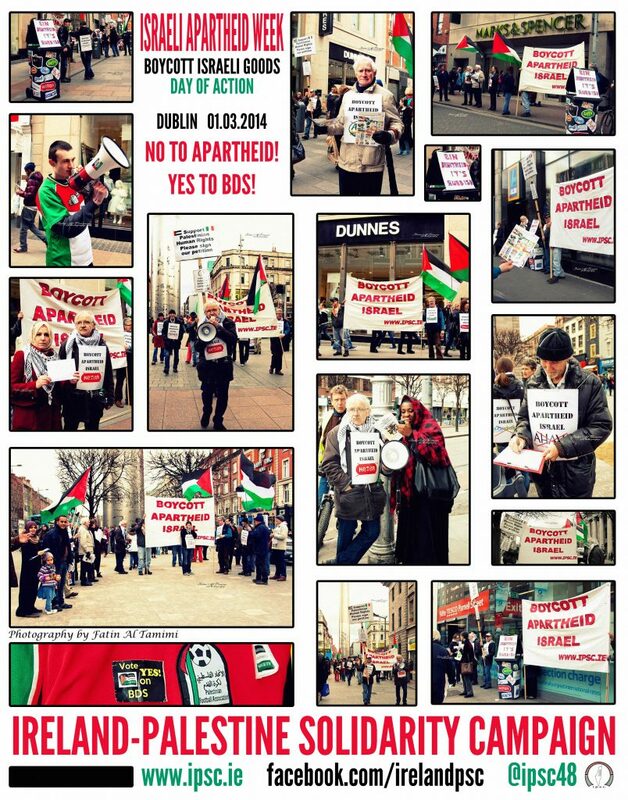 On Saturday 1st March, the Dublin IPSC branch of the kicked off IAW with a Boycott Israeli Goods day of action. We visited four city centre supermarkets, making consumers aware of their presence, the connection between these products and the occupation of Palestine and asking people to boycott them. We also handed in letters of protest to the management of each store, asking them to cease sticking Israeli goods. Departing from Dublin’s Spire with our ‘Boycott Israeli Apartheid’ banner, and the ‘Dustin of History’ asking people to ‘Bin Apartheid, It’s Rubbish’, our first stop was Dunne Stores on Henry Street, to highlight that 2014 is the 20th anniversary of the famous Anti-Apartheid strike by members of IDATU who refused to handle goods from Apartheid South Africa. 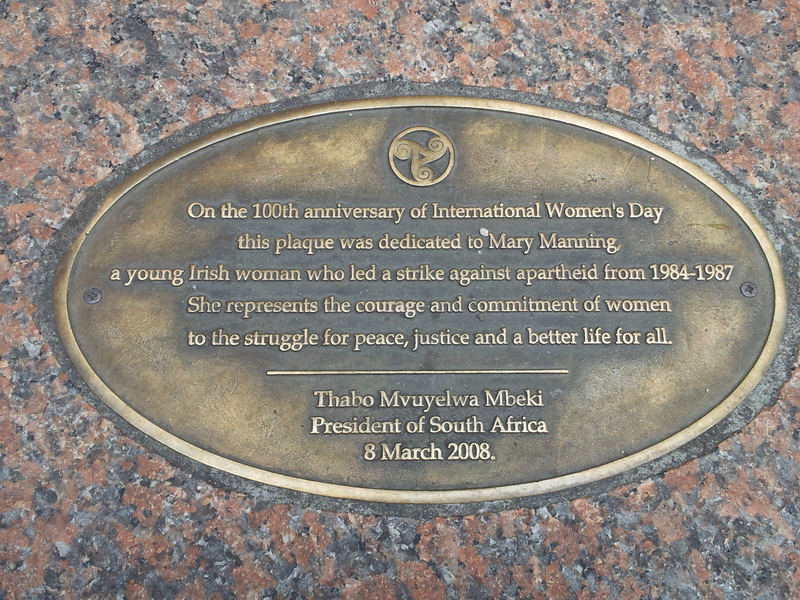 It is shameful that two decades on, Dunnes Stores would again allow itself to be on the wrong side of history, profiting from the products of another Apartheid regime. For a full report from the Day of Action, please see here. 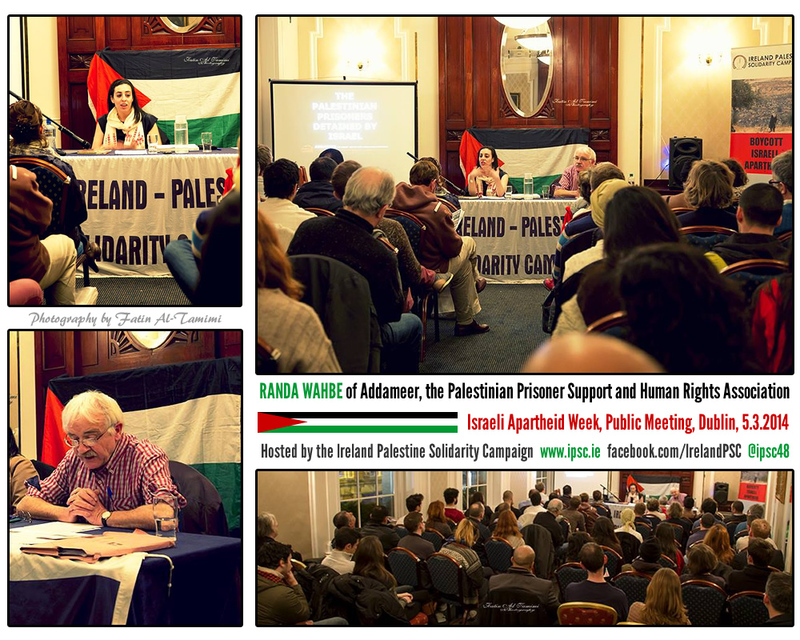 On Monday 3rd March, the amazing Randa Wahbe, Advocacy Officer of Addameer, the Palestinian Prisoner Support and Human Rights Association began a four-city tour of Ireland in Galway University. There were also very successful and informative meetings held in Limerick, Dublin and Cork. Ms. Wahbe talked about the situation of the Palestinian political prisoners, of which there are now over 5,000 in Israeli jails, including 155 Administrative Detainees, 12 parliamentarians, 17 women and 154 children. Since the beginning of the Israeli occupation of Palestinian territories in 1967, between 750,000-800,000 Palestinians have been detained by the Israeli military. According to Amnesty, “many [have been] held incommunicado for prolonged periods”. This figure represents approximately 40% of the total male population in occupied Palestinian territory. LISTEN TO THE PODCAST: You can listen to a podcast recording of Ms. Wahbe’s talk in Dublin by clicking here (MP3, Right Click and ‘Save Target/Link As’). While in Ireland Ms Wahbe also met with politicians in the Oireachtas (Irish parliament), NGOs and trade unionists. In these meetings she reiterated the view of the majority of Palestinian civil society organisations that the Boycott, Divestment and Sanctions movement is the best means of applying pressure on Israel and companies complicit in the occupations and human rights and international law violations, such as the private security firm G4S, which provides tech and maintenance services to the Israeli prison regime. At lunchtime on Thursday 6th March, a symbolic vigil took place outside EU House on Molesworth Street, the offices of the European Union in Ireland. We highlighted the issue of Palestinian political prisoners, and the role of the EU in facilitating Israeli apartheid and abuses against the Palestinian people, and called for Israel’s suspension from the Euro-Med agreement which grants it trading privileges with the EU, in effect a reward for its terrorisation of Palestinian people. You can read the leaflet we distributed to hundreds of passersby here – Leaflet (PDF). Coincidentally, in the midst of Israeli Apartheid Week, Galway Student’s Union was engaged in a referendum on whether the SU would “actively support the campaign of Boycott, Divestment and Sanctions against the State of Israel.” In a crushing defeat for pro-Apartheid, anti-Palestinian forces who attempted to astroturf a ‘No’ campaign on campus, NUIG students voted almost 2:1 in favour of the motion and the SU made history by becoming the first in the country to join the international BDS movement. For more information on the referendum, see here. Finally, ending IAW with a bang, we held our fourth annual ‘Palestine Fight Night’, a night of male and female white-collar boxing. 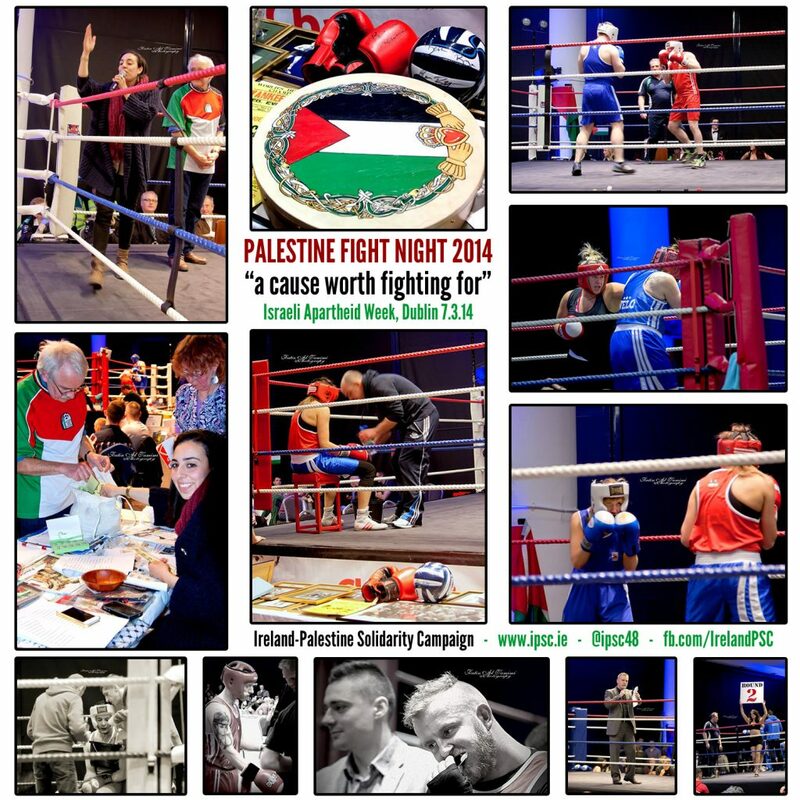 Hundreds of people attended, and it was undoubtedly our most successful fight night yet, raising lots of much need funds for our campaigns over the next year, which is of course the UN-designated International Year of Solidarity With the Palestinian People. We’d like to thank everyone involved in the night, from bar staff, to medical teams to security, but especially the boxers themselves, who trained very hard and really put themselves out there on the night. 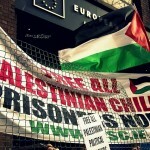 Palestine – a cause worth fighting for indeed!